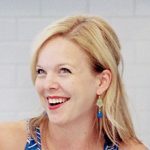 I had so many recipes I wanted to share with you before Thanksgiving. This weekend I went over them again and again, in my head and out loud to Ben (sorry honey) – which would be the three that made the cut? While I was mulling this over, I decided to bake up some cookies for a non-traditional Thanksgiving crab fest hosted by my dear friends and our family photogs Bobbi and Mike (yeah, they’re kind of a big deal.) This was the morning after we hosted our own Friendsgiving, so the criteria for whatever I made were few – I wanted something simple, only requiring ingredients I had on hand, and fitting somewhere in the general realm of Thanksgiving dessert. Enter these apple pie cookies. Next thing I knew, all other possibilities got the boot because you need to know about these right now. Such a simple yet brilliant concept. Two small rounds of buttery, flaky pie crust sandwiching an apple slice coated in cinnamon sugar, and detailed to look like a tiny little pie. I was and still am completely enamored with these cookies. As Ben pointed out the only real feature that makes them a cookie is their shape and size, but I think that’s what makes these an ideal dessert for Thanksgiving day. 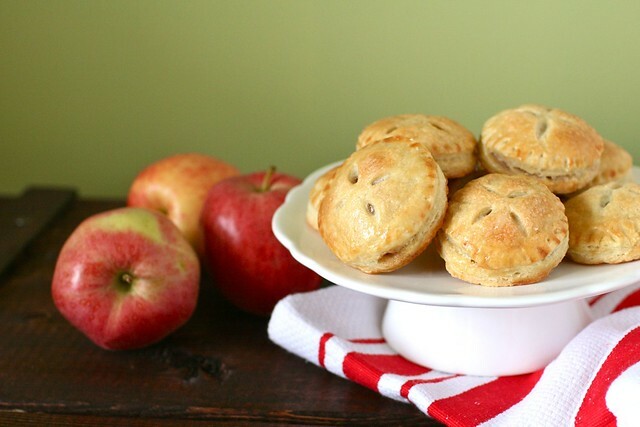 There are always so many different desserts to sample – staples like pecan and pumpkin pie, plus a variety of others – and these little sweet treats let you have just a few bites of apple pie without committing to a full piece. Whether you are hosting or attending someone else’s big meal, I’m feel pretty certain these will be a hit wherever you serve them. 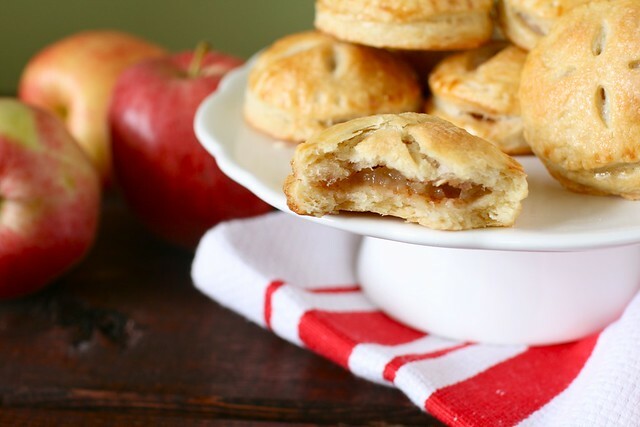 Apple pie cookies – make it happen. *Note – I know some of you will be tempted to ask, can I just do this with frozen pie crust? And the answer is of course you could, but I highly recommend making your own. It tastes much better and it’s way easier than you might think. See this tutorial for step-by-step photos. To make the pie dough, combine the flour, sugar, and salt in a medium bowl and stir with a fork to blend. Using a pastry cutter (or your preferred method), cut the butter into the flour mixture until the mixture is coarse and the largest pieces of butter are no bigger than small peas. Stir in the water and mix gently just until the dough has come together in a a cohesive ball and all of the dry ingredients have been moistened. Form the dough into a disc and cover tightly with plastic wrap. Transfer to the refrigerator and chill for at least 1 hour. When you are ready to make your cookies, preheat the oven to 350˚ F. Line baking sheets with silicone baking mats or parchment paper. Peel the apples and cut off the sides in four large chunks, removing and discarding the cores. With each large piece of apple, further slice into thin slices (somewhere between 1/8- and ¼-inch thick.) Use a small round cookie or biscuit cutter (about 2 inches in diameter) to cut round discs out of the apple slices. Place the apple rounds in a bowl and toss with the lemon juice. In another small bowl, combine the sugar, cinnamon, and nutmeg, and whisk to blend. To assemble the cookies, transfer half of the chilled pie dough to a lightly floured work surface (keep the remaining half chilled). Use a rolling pin to roll the dough out very thin, about 1/8 to ¼-inch thick. Use a larger round biscuit or cookie cutter (about 2½ to 2¾ inches in diameter) to cut out rounds of the pie dough. Transfer half of the rounds to the prepared baking sheet. Brush the rounds lightly with water (this will help the pies seal). Take a few apple slices at a time and coat them in the cinnamon-sugar mixture. Place each on top of a round of pie dough. Layer a second round of dough on top of each apple slice and gently press the edges to help seal. Repeat this process with the remaining dough and apple slices. Crimp and seal the edges of the mini pies with the tines of a fork, dipping in flour if needed to prevent sticking. Lightly brush the tops of the cookies with the egg wash. Use a small paring knife to cut tiny slits in the top of each cookie. Sprinkle with additional sugar, if desired. Bake for 25-28 minutes or until light golden brown.